A great fun evening. Check out the routes! Short course winner Graham paying for his exertions! First off, thanks to Mark Lockett for his considerate "offer" to collect in the controls...! This strange new format is now becoming more familiar to a small but growing band of people. 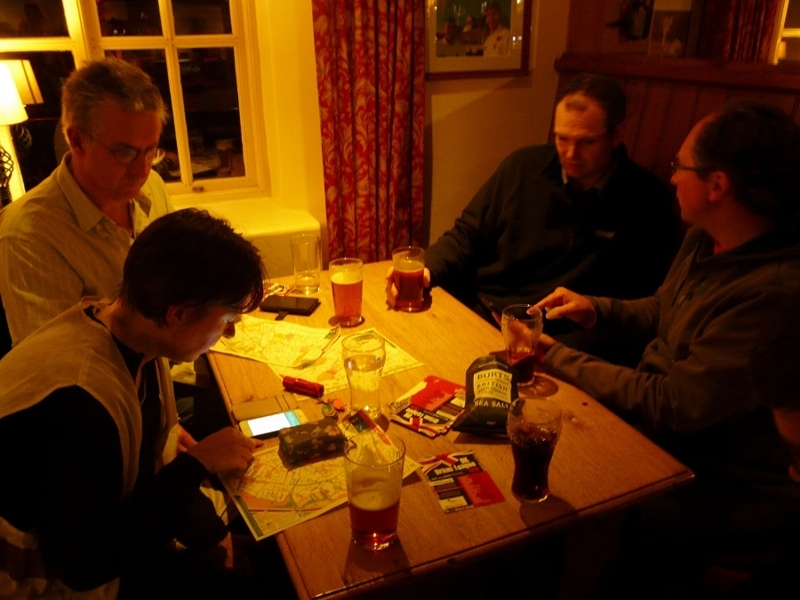 One notable advantage is the ability to review routes on Routegadget over a pint immediately after in the event in the pub adjoining the event base (see photo)! I was particularly excited about putting on this event as with it being on my doorstep, I was well aware of the area's potential for an urban event. 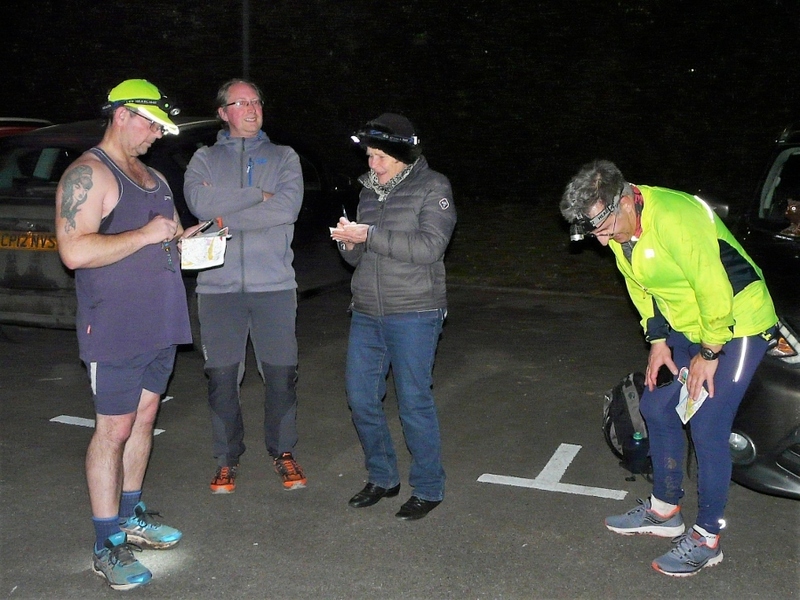 One finisher opined "this area was made for orienteering", having initially got to grips with and then been left bamboozled by the myriad paths, open areas, dead ends and route choices. Though the north section of the map had been used in its OCAD guise for a variety of urban events, it had always surprised me that the south bit (Upper Holway) had been overlooked. The open source mapping provided a decent base map but I did need to update it extensively. Something for those interested in planning to bear in mind- using an existing map saves a lot of time. Though we orienteers do like our novelty, so please feel free to update your own local / favourite map. Thanks to Roger and Judy Craddock for organising and to several competitors who offered constructive feedback. PS- three peoples' scores now amended to reflect the delay or points they missed at control no. 20. Best 2 scores to count from the 3 event mini-series. 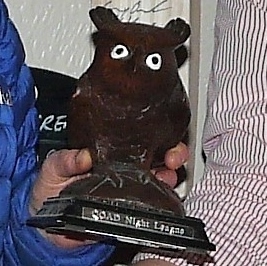 Prize- the Night Owl trophy (pictured). All runners eligible, regardless of whether they run the long or the short course. Gavin Clegg ran the long course, which was roughly a third longer than the short course. His score of 750 therefore increased to 1000. The standard orienteering age/ gender handicap factor was then applied to his score, as it was for all other competitors below. Maybe we should be encouraging more entries in this category? MapRun doesn't need kites, control units or dibbers. All users need is the smartphone app. Immediately after your run, you can upload your score and time to the web and compare how you did with others. Read more about MapRun and the app in our dedicated section here. We'd be really grateful if you could let us know if you're coming, to help us determine map numbers. Produced from Open Orienteering Maps. See map excerpt above. It contains more detail than a basic 'stick' map of the streets, but less detail than OCAD maps. Please note the blue used in rivers and streams doesn't look too different to the green used for woods. Forbidden routes will be marked by a purple cross or a series of these, most obviously for safety and access reasons. They are occasionally used to exclude from your route choice an option which doesn't present a technical challenge i.e. a long straight road. The priority for all entrants should be to return safely. We are using predominantly residential areas with 30mph speed limits. These areas are sometimes bounded by faster roads, which there should be no need to cross. Suggested (but not compulsory) crossing points (the symbol is two purple curved lines) are marked on the map. Forbidden routes are marked with purple crosses. The above two symbols can look similar- take care! Barriers - public fences and walls should not be crossed unless they can be without climbing and danger of injury to competitor or damage to the barrier. Please show courtesy and understanding towards those you encounter on your run. A friendly 'hello' can often smooth the way. You must take a paper map with you and should not rely on the onscreen map, which may not be the most up-to-date version of the map. All participants must return to the assembly point before course closure time of 8pm, even if they have not completed their run. Results must be uploaded to the server at that point. Under 16s taking part must be accompanied by an adult at all times on the course. Each event starts from a pub/restaurant, giving you the option of unwinding after your run. 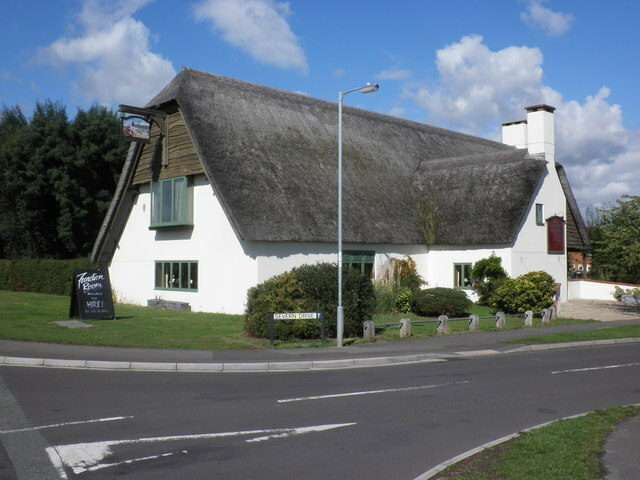 Parking at the Master Thatcher pub, Liseux Way, Taunton TA1 2PD (pictured). The pub have kindly allocated us parking at the far end of the car park to the rear, where we also anticipate basing our welcome/registration- look out for the yellow QO banner. Please do not use any other part of the car park. Should we run out of parking spaces at the pub, the shopping parade (with a Tesco Express) opposite has plenty of free spaces for customers' use. Two courses are offered, Long and Short, using exactly the same controls. Both are "Score" courses, meaning there isn't a set order to the controls you visit. Short Score- the order of the controls you want to visit is entirely up to you. Long Score- there are two sets of controls, one set tackled after the other. Once you switch to the second set, you cannot go back to the first set. The optimum routes are typically 9k for the long and 6.5k for the short. Each course has a time limit of 50 minutes. Points will be deducted at a rate of 30 points per minute for each minute or part minute you're late back. Points values for controls are variable and denoted by the first number of the control, e.g. 62 scores 60 points. The control circles on the map are coloured red on one set and blue on the other- the colours are meaningful only for the Long score. For those who took part in our QOADs series, the Long score uses essentially the same scoring system. Your phone should beep when you get within 10m of the "control". Occasionally, your GPS signal may drift- you may have to wait a few moments for it to 'catch up'. Our GPS controls tend to be located on lamp posts where the GPS controls work well. 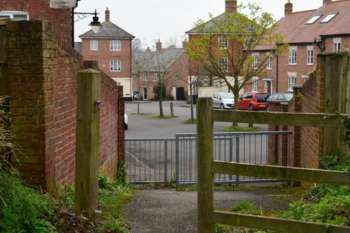 Wooden telegraph poles, signs and other street furniture, fences, bridges and play or sports equipment in parks may also be used. Those controls that are not on lamp posts will be listed on the map and on control description sheets. Please print off and fill in our standard registration form in advance (or email it to us) as we are trying to keep the event organisation low key. Ignore the boxes about 'SI' unless you are hiring a club phone, in which case fill in the details we usually request off those hiring SI dibbers. £5 - for both adults and juniors with accompanying adult. On payment you will be given a PIN code which will activate the course on the app. We have four tried and tested Alcatel club smartphones available for hire on a first come, first served basis. Please contact the organiser in advance to reserve one. Start times from 17.00 to 19.00. You effectively have a choice between running in partial daylight or in the dark. 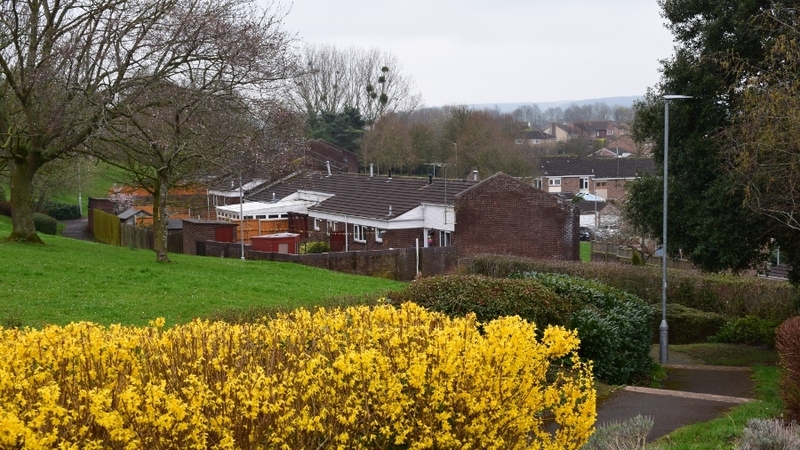 Suburb of Taunton with good variation in terrain, featuring maze-like estates with excellent path networks and open green space as well as parks, scrub and a sports ground. The car speed limit does not exceed 30mph throughout the area. There are some busy main roads, particularly the one running past the pub which continues in a vaguely north-south direction and the road running past the sports centre to the east. Please take extra care crossing these roads and consider using the crossing points marked on the map. For those who enjoy getting off the paths and taking direct routes across the ubiquitous grass, please note there are steep unmapped banks alongside parts of Chestnut Drive, the main road bisecting the southern half of the map N-S. The are to the south has several unmapped flights of steps. The areas of scrub to the south of the sports centre (Blackbrook Pavilion, to the east) can feel quite isolated in darkness, some of the paths can be muddy and there is undergrowth in the open areas. You may wish to avoid it. You will only miss out on one control (worth 20 points) if so. Slippy, grassy slopes are a common feature. There is potentially a small ditch to jump that forms the eastern border of the Sports centre grounds. The Finish control is in the middle of the pub car park. It is most safely accessed by a path (mapped) running alongside the pub. The Master Thatcher advertises itself as being child and dog friendly. It has toilets for customer use only plus free WiFi.